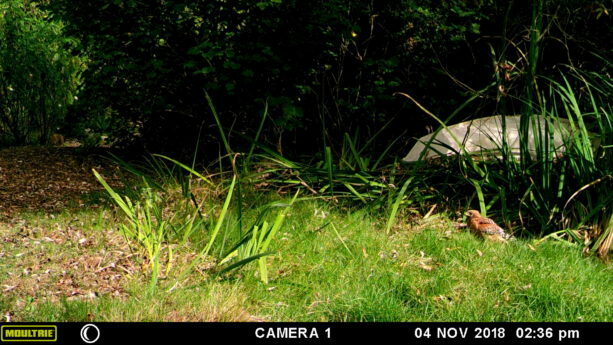 This entry was posted in Animals, Birding, Gardening adventures, Preditors, Water and tagged Animals, Bird Watching, Bogs, Game Camera, Habitat, Permaculture, Ponds, Wildlife. Bookmark the permalink. Yes most of the young trees I planted last year have survived, but I have lost a few, I guess that’s only to be expected, especially as I was on holiday interstate with my family for two week recently and so nothing was watered. Also as well as having had little rain over autumn, winter and spring, while I was away from home we had above average temperatures, still I was pleasantly surprised at how well everything looked and have been watering like mad since I got home. The peach trees I planted about eight years ago are quite big and happily I had planted them close together, so they now form a bit of a small canopy, but the trees I’ve planted in the last couple of years have been tube stock (tiny) so they have a way to go yet. Buying them small is cheaper so I can buy more. I am hoping to take cuttings of the ones that do well to increase my plantings. I still have grass, dry and brown looking, but still slightly green at ground level, also some green clover as well. Neighbouring properties are brown and bare, so I think the swales are helping me, and I think because of this grass the kangaroos have left my trees alone so far, but it really looks like the end of summer here, instead of they beginning. We do indeed live in interesting times! Thanks, Margaret! We’ve always had raccoons here; they like to poop on the roof. ‘First flush’ means something different for us when it begins to rain! 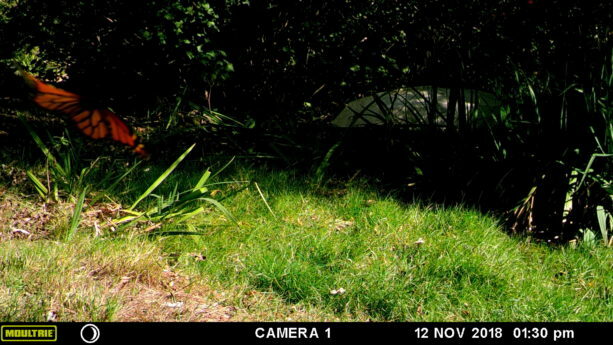 The really amazing creature the camera captured is the young hawk. He likes standing around the bog. We also caught a Cooper’s hawk standing there, too. Maybe for a bath and a drink? Most of the photos are of ducks and raccoons. I love the camera! Thanks for commenting; great to hear from you! First of all, Happy Birthday Diane. 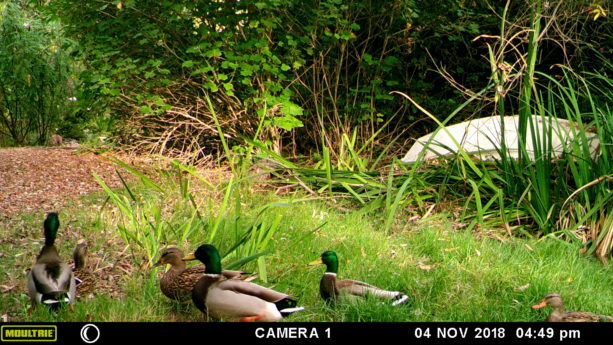 That trail camera is great. 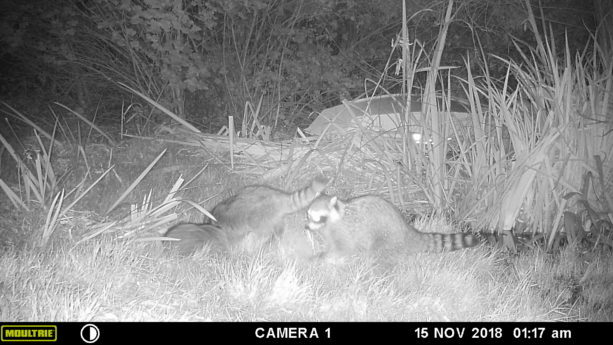 The racoons surprised me. I’ve never seen any here. 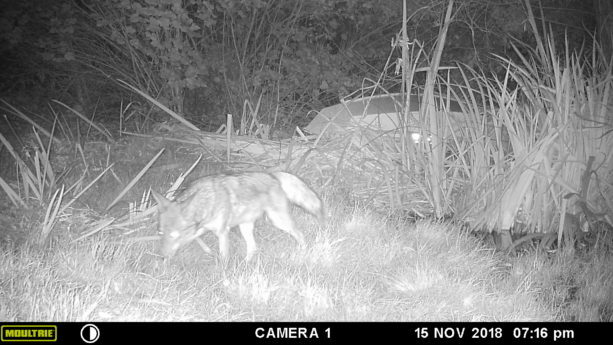 It is amazing to see what stops by the pond during the night. 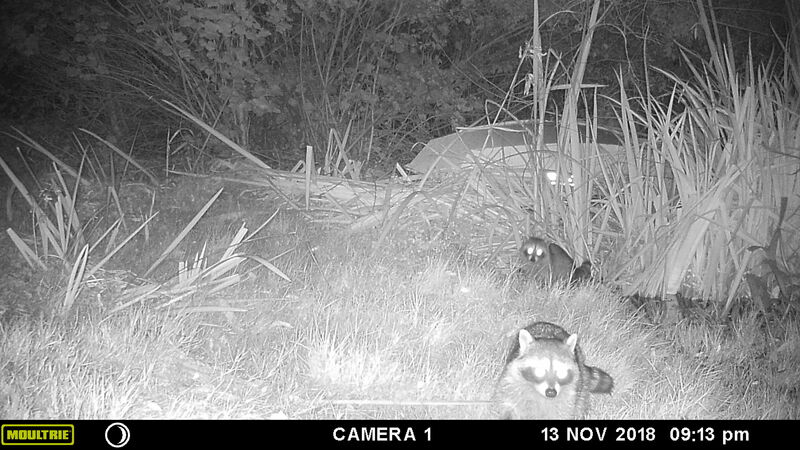 Will look forward to more photos of the night critters. I am so very pleased you and your sanctuary are safe from the terrible fires. It’s lovely to see the videos looking so green and healthy. How interesting to see the wildlife that moves through at night and even the daytime when no one is around to disturb them. If only everyone who could, used permaculture principals we would not have these tragedies on such a catastrophic scale. My own little food forest is growing slowly, and as we’ve had two dry winters and springs in a row it would not be growing at all if I hadn’t dug the swales. One of my grandsons has taken the horses to a more fitting environment, and I am planning to extend the planting, into the paddock they used to be in here. Videos like yours keep me motivated.